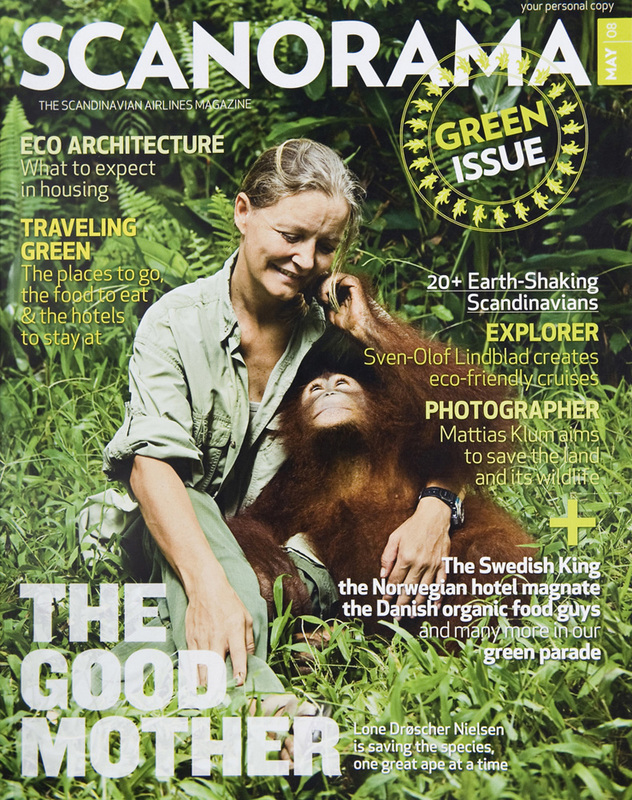 Of the 57 events that we have held over the past five years, those featuring the work with orangutans in Indonesia by Lone Droscher Nielsen remain both the most heart-wrenching and yet also the most uplifting. Lone first appeared at the Wootton Talks in 2009 and again drew large audiences when she returned exactly four years later for a couple of nights on November 22nd and 23rd, highlighting both the cruelty of which people are capable – and also the determined spirit of others to help save the orangutan from extinction in the wild. After first witnessing the plight of the orangutans over twenty years ago, Lone promised the animals she would be their voice in the world, and so quit her job as a flight attendant with Scandanavian Airlines and sold all her possessions. She moved to Indonesian Borneo and set up a rescue centre in 1999 with a $50,000 loan after two years of trying – and it is now the world’s biggest primate rescue and rehabilitation centre, currently caring for over 600 orangutans, mostly orphans. Her aim had always been to care for the animals but also to prepare them for release back into the rainforest. Numbers of orangutans are dwindling because the rainforest is being destroyed both for logging, and also totally cleared for planting trees to feed the palm oil industry, catering largely for the western world. The oil is an ingredient in hundreds of products used daily, including shampoo, chocolate and margarine and the clearance of the rainforest is undertaken purely for consumer demands. Some palm oil is from sustainable sources and yet much is not – but the encouraging news is that new EU laws will next year force manufacturers to identity if their products contain palm oil and also its source. Lone made it very clear that her work does not only involve cuddling baby orangutans and the endless night-feeds (on one occasion, she had over 30 staying in her house at the project). 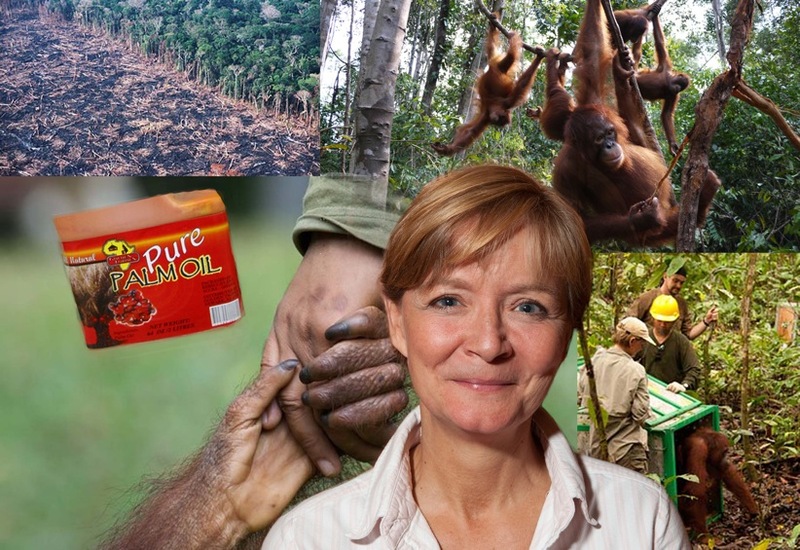 She also spends a great deal of time fighting bureaucracy, corruption and greed, with the expansion of the monoculture palm oil industry the biggest single threat to the continued existence of the orangutan in the wild. Rainforest destruction had made it very hard to find appropriate release sites for the orangutans but Lone found the Beticap area, which is perfect for the animals and, last year, the Indonesian government gave her team permission to use 35,000 hectares of protected forest – in which there is room for approximately 325 orangutans to exist happily. 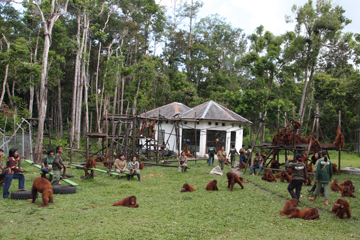 Just over 80 have now been released (as seen in a recent BBC Natural World film) and, despite scepticism from some scientists, early signs are extremely encouraging that – despite having been fed daily and cared for at the sanctuary – the orangutans have adapted to looking after themselves and feeding on fruit in the forest. Starting out in "forest-school" at Lone's project, the animals progress to “university” on forested river-islands. Once ready for release, they are given extensive health checks and then airlifted to the release sites (at considerable expense) and, in a pioneering move, are fitted with radio transmitters so their movements can be monitored. Already, Lone told us, the exercise is proving that releasing orangutans back into the wild can be successful and worth the money needed to do it – and watching the orangutans climb high into the trees gives her an intense feeling of joy. Some of the most powerful sequences during her talk, with stirring music and lyrics, showed desperate animals being rounded up in destroyed rainforest and then carried, barely alive, to the centre. Often, she said, it is wonderful to witness the transformation of the orangutans climbing the trees, compared with the appalling condition of many animals when they first arrive at the centre. Many are traumatised after seeing their mothers hacked to death and some have even had fingers sliced off, with their eyes showing they have lost the will to live. But Lone and her team of “baby-sitters” spend countless hours caring for them and rehabilitating them. She told us that young orangutans have the same range of personalities as children – stubborn, crafty, warm, intelligent, slower – and she feels grief when they die, including those occasions when diseases are passed on, although all the animals are buried in a forest-cemetery with marked graves. A measure of her dedication is that the Indonesian government this year gave her a major award for her conservation work and the Indonesian ambassador to Denmark presented her with another award in Copenhagen, when he described her as a “conservation hero”. Over 200 people attended Lone's talks and audience donations totalled £1,034, with many taking away forms to adopt an orangutan.. Total proceeds from both evenings was £1,239 with the Talks Team making a donation to the Save the Orangutan fund, as well as adopting an orangutan. Lone also sold and signed ten copies of her inspiring book, called Freedom.